Sirenia gets right to business on its ninth effort, Arcane Astral Aeons, with the crushing “In Styx Embrace”. The driving guitar riffs and grooving percussion meld well with the orchestral elements. We are even treated to blast beats before transitions to an acoustic passage before concluding in bombastic fashion. Album single “Into The Night” is a mid tempo rocker with a catchy chorus and some splendid keyboard work. Guitarist Morten Veland unleashes a blistering solo that concludes too soon. “Love Like Cyanide” is the initial single off Astral, with a pumping percussion underneath choppy, classically inspired guitar riffs. Vocalist Emmanuelle Zoldan sounds both powerful and vulnerable here, as she laments about toxic love. The track’s midsection is notable for its gothic chorus and tight groove. “Desire” has a thick galloping riff that accentuates Zoldan’s sultry vocals. She even sings a passage in French over a playful melody before the song kicks back in to high gear with a stomping guitar riff and a black metal interlude. “Asphyxia” commences with a dissonant guitar riff and a dark ambient electronic sample that segues in to a sludgy guitar riff. There is greater use of industrial and electronica samples on this song, making it an interesting listen. “The Voyage” is aptly named as its rollicking guitars symbolize a vessel moving to and fro across a hostile sea. This is a dynamic, heavy track with a howling arabesque guitar lead that accentuates the adventurous tone on this track. Arcane Astral Aeons is 55 minutes long, but there are few dull spots on this record. The album’s 11 tracks are diverse, yet cohesive. This is attributed to several elements of black metal and grooving rhythms appearing throughout the album. Thus, Astral is not monotonous, but there is an aura of similarity to each track. I have said numerous times that symphonic and progressive metal bands have to make extra strides to avoid pretentious and wayward songs. Well, Sirenia have avoided the trap with ease. Zoldan’s grandiose vocals are superb as usual and the guitar riffs are thick and pack a wallop. Ultimately, Astral is a crushing record with a nice blend of orchestral and electronica samples. Fans will certainly enjoy it as the band’s signature sound is intact with a new black metal element that makes it heavier. 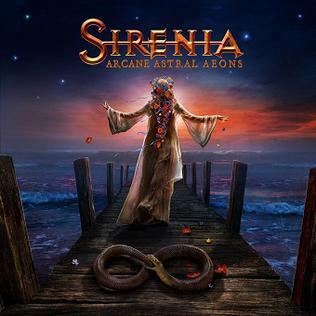 Sirenia continue to reach the stars.